Join Elaine Curry for a 2 weekend course of kids yoga teacher training In June here at Maitri Studio. 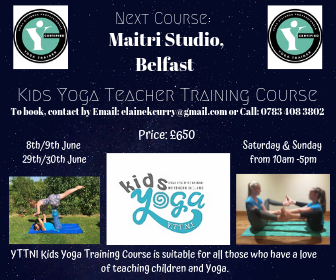 Ideal for those who have a love of teaching children and yoga. Class numbers are kept small to ensure all students get high quality training. You also get the opportunity to teach a class of children ensuring proper practical experience before completing the course. Dates: Saturday 8th & Sunday 9th June and then Saturday 29th & Sunday 30th June 2019. Elaine is a senior yoga teacher with Yoga Alliance Professionals. She is passionate about delivering safe and effective Yoga and Pilates classes. Elaine believes that anyone can do Yoga and Pilates and has taught baby yoga through to chair exercise, sports yoga and everything in between. As well as teaching yoga and Pilates Elaine is a complementary therapist and runs Calm Confident Kids, a training company for baby and kids yoga and children’s reflexology. She provides classes on nutrition, complementary therapies, Yoga & Pilates for schools, community groups and sports teams.